The undeniable beauty, lush tropical climate, and exciting recreational activities of Oahu are what brings visitors to this Hawaiian island all year long. With many attractive cities and destinations, the town of Kailua is among one of home buyers’ favorite areas because of its natural beauty and charming real estate. Located on the windward coast of Oahu, Kailua is situated between the villages of Waimanalo to the south and Mokapu to the north. Kailua borders the lagoons of Kailua Bay and Kaneohe Bay, which is how the town received its name, as Kailua means “two seas” in Hawaiian. With a population of nearly 39,000, the town of Kailua continues to grow as more people discover this hidden gem and it’s unique beauty. Kailua residents enjoy everyday access to amenities such as dining, shopping, and fun recreation that individuals of all ages will love. Beautiful beaches such as Kalama Beach Park, Lanikai Beach, and Kailua Beach Park attracts visitors and locals alike, with its sandy shores and warm water as the main points of interest. Loosely bounded by the Kalanianaole Highway and the John A. Burns Freeway, transportation is easily accessible for commuters and travelers alike. With neighborhoods surrounding the local mall known as the Windward Town and Country Plaza, there is no need to travel far to fulfill their shopping and dining necessities. 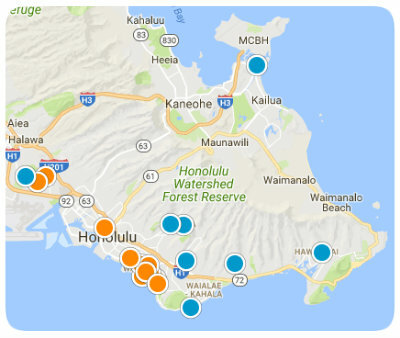 Kailua offers its residents a variety of different styles, locations, and sizes of real estate properties. You will find grand scale estates, affordable starter homes, and numerous condominium and townhome options. The community of Kailua contains some of the finest homes in Honolulu, with space ranging anywhere from 1,500 to 5,000 square feet. Depending on the property’s age, size, and special features, home buyers will find a large range of prices, with more than enough options to accommodate any budget. Kailua encompasses an area of nearly eleven square miles, of which you will find an abundance of natural beauty, marshy wetlands, and extravagant real estate just waiting to be discovered. If you would like more information regarding homes for sale near Kailua, Honolulu, please allow us to assist you and contact us today.